An early cut of Ray Gutierrez's documentary The Making of a Champion "The Barista's Story" explores the lives of hearing impaired students in rural India. Ray Gutierrez (right of center in gray shirt) poses with students of Centurion University. Photo courtesy of Ray Gutierrez. 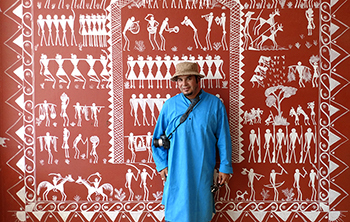 Ray Gutierrez with a mural of tribal symbols at Centurion University. Photo courtesy of Ray Gutierrez. A university education can be more than classes, tests, and essays. Last summer Ray Gutierrez’s coursework took him to India, where he filmed a documentary about hearing-impaired students facing a gut-wrenching choice between family and opportunity. Ray Gutierrez (Oakes ‘18, film) does not present himself as an adventurer about to travel the world. He says he’s very shy, though he is gregarious and fills his conversations with compliments and gratitude. If he is shy, it isn’t stopping him from pursuing his ambitions. Gutierrez grew up in Gilroy. He would make up stories to tell his brothers, which grew into an interest in film. He studied at Gavilan Community College and transferred to UC Santa Cruz in 2016. He’s the first in his family to attend a four-year university. His parents worked on his grandfather’s cucumber farm. Shortly after he came to UC Santa Cruz, he learned that an anthropology field study, Globalization, Technology and Development, which included five weeks of study in India, had room for more students. He approached the sponsoring professor, anthropology lecturer Annapurna Pandey, and told her he wanted to come and make a documentary while he was there. “I was thrilled,” Pandey says. She hoped his project would help show other students the unique experiences possible with field studies. In July, Gutierrez joined Pandey and the field study cohort at Centurion University in the mostly rural Indian state of Odisha. Centurion was established to train Odisha’s youths with skills relevant in a modernizing economy. During their five weeks in India, the UC Santa Cruz students lived and studied alongside Centurion’s regular students. They toured of the region, visiting sites like the famous Sun Temple. And they spent 12-hour days interviewing students and teachers about the culture of Odisha and how global influences are affecting it. One of the groups they met were the students with hearing impairments. These youths, who might otherwise have spent their lives in subsistence agriculture, were training to be baristas. In Odisha, where many children are expected to live at home and support their parents until they marry, a disability like deafness might mean a very limited life. The barista training offers an avenue to self-support and the possibility of switching roles from dependent to breadwinner. Gutierrez decided they would be the subject of his documentary. The documentary, an early cut of which is linked at the top of this article, follows the students through a day marked by intense study and camaraderie. His subject’s lives included tensions he had never imagined. They felt both dedication and intense obligation to family. “The primary concern was what I can do for mom and dad because they brought me to this Earth,” Gutierrez says. Not every family wanted their child to leave and find work. Some of the women felt pressured to return home and get married. This group with all their shared struggles formed a supportive community. They would applaud each other’s work. The 30 or so students went from class to class together communicating through text messaging. “They had to study from 7 a.m. to 11 at night and they loved it,” says Gutierrez. Their determination, he says, inspired him to be a better student. Graduation from the training brought a new challenge. The students would be placed in positions at cafés around the country. Most had not travelled more than 20 miles from home before coming to Centurion. Gutierrez hopes to be able to return next summer to find out whether the barista trainees will continue toward careers or return to their families. He hopes by introducing people to these “heroes in a noisy world,” his documentary will help overcome cultural differences. “The only thing different from us is our cultures, but that’s a beautiful thing,” he says. When he graduates, Gutierrez wants to focus on international collaborative film projects.